I have a total of two legit sources for Asian cuisine, not counting the vast expanse of cyberspace that is undoubtedly a resourceful source… though, albeit, not as personal. One is a close friend that has lived (and cooked) in several locales in Asia for brief stints over the course of her life, and the other is my Vietnamese hair stylist of nearly a decade. The former can talk the talk and walk the walk in terms of ingredients, sauces, and cooking methods… all of which I say that I will one day glean from her and yet, to date, have not done so (that will soon change). The latter, though extremely well qualified in her field of business and certainly well acquainted with the cuisine of Vietnam due to her heritage, isn’t the true cook in her family… her elderly mother is. And so, with her, our conversations are more ones of how great something her mother made was, followed by my full attention and interest… with little content on how whatever it was got to be so great (as in… what exactly were the ingredients?) It’s a bit like a very enjoyable game of charades. 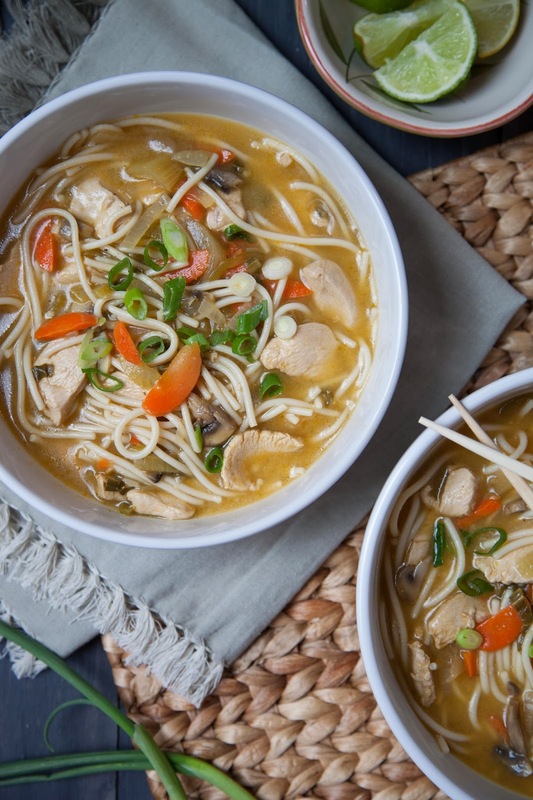 And so, I’ve experimented a bit here and there with the flavors of Asian cuisine… especially when it comes to soup. Like many others, Pho (popular and pretty mainstream in cities across the US) is a personal favorite. Though, like many ethnic cuisines plated up in restaurants and households around the world, it varies depending upon where you are and who’s doing the cooking. I suppose that’s what is so great about cooking anything… it’s okay to put your own particular spin on it… one that pleases your own palate and table partners without getting too caught up in the nomenclature... perhaps "A Tasty Soup" is good enough. 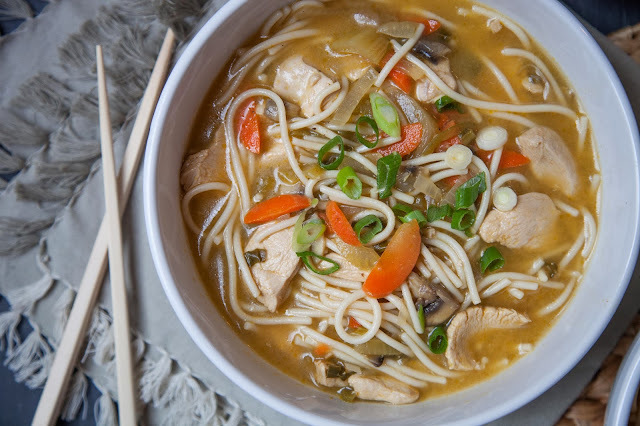 In this particular "tasty" soup, it’s simply a combination of some of my favorite veggies and a broth that delivers... with an Asian-flavored bend. One of the key goals in developing this soup was keeping the flavor profile ingredients relatively simple knowing that my daughters will want to make it in their own homes… but will not want to buy 100 different ingredients in order to do so. The veggies can be pretty much whatever you love. 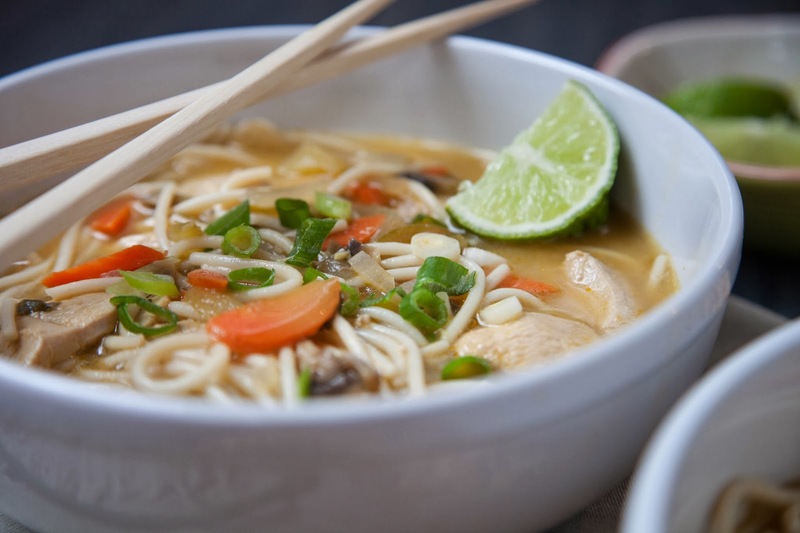 The broth is veggie based with four primary enhancers: sriracha sauce, tamari, lemongrass paste (keeps in the fridge fairly well and is easy to use), and lime juice (freshly squeezed). And, apart from key veggies and broth additives, a good chop of jalapeño chili, cilantro and green onion are essential… in my opinion. 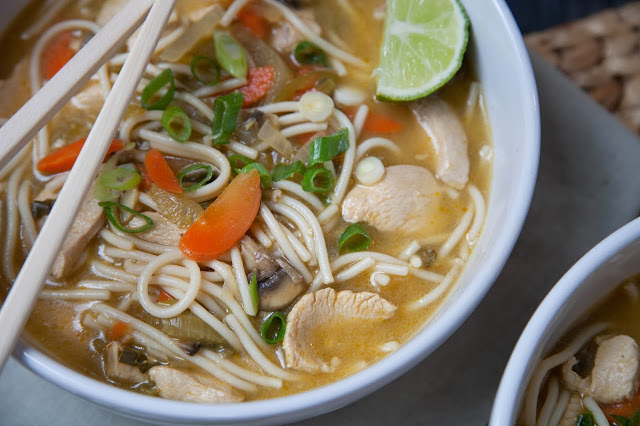 Beyond that, you can chop and drop whatever appeals to your own palate, tasting the broth along the way to arrive at your own perfect Pho… Asian-Inspired Soup… Asian-Noodle Soup… Tasty Soup! I slice the larger veggies (carrots, celery, green onions) and chicken thinly, on the diagonal (just because I like the look). And, while this recipe reflects the most recent plating of this soup, I tend to chop, drop and season as I cook so always suggest that you taste the broth as you simmer away and adjust as you like. I tend to lean on the srirachi, tamari and lime juice to balance the flavor profile. While I typically use 1 1/2 cartons of the broth, I always save the remaining 1/2 carton of broth for Day 2 as the soup may thicken and need some thinning. You can add a cup of water on Day 2 if further thinning is needed. And, of course, more flavoring. *I break "spaghetti" noodles in half before adding to boiling water to cook... to keep the "stir-ability" of soup a bit easier once added. Heat olive oil in a large soup pot, set over medium heat. Add veggies (bok choy, onion, celery, carrot, mushrooms, and jalapeño chili) and sauté until onion is translucent and bok choy has wilted; about 5 to 8 minutes. Add salt, pepper and 1 tablespoon of tamari to veggies and heat through. Add 3/4 of your broth (48 of 64 ounces), lemongrass paste, srirachi, lime juice, and remaining tamari. Stir well to combine and heat through, adjusting flavor (as preferred). Bring soup to a low boil and add raw chicken (to cook in broth). Simmer soup on low boil until chicken is cooked through (10 to 15 minutes). Add cooked noodles and 1/2 cup chopped cilantro. Lower heat to slight simmer and continue to cook for another 15 to 20 minutes. Ladle into bowls and top with sliced green onion, cilantro, sliced jalapeño (as preferred). Reserve remaining 16 ounces of broth to thin out soup on Day 2, if needed.